Is it better blindly to battle an enemy or to find out whether it’s possible to make friends? If you chose the second option, you already know the lesson that the new animated movie, How to Train Your Dragon, tries to teach. This unmistakably instructive bit of DreamWorks animation encourages kids to explore the idea that empathy might be more powerful than hostility. How to Train Your Dragon operates on the assumption that ... well ... assumptions can be dangerous. To prove its point, the movie drops us into a world of scruffy Vikings who live on a rugged cliff overlooking an ocean expanse. For as long as anyone can remember, the movie’s Vikings have assumed that dragons are an enemy that must be battled at every fire-breathing turn. Having constructed their society around combat, the Vikings never bother to get close enough to dragons to learn whether these fearsome-looking creatures represent a real threat. As a result, Vikings live in a world of severely reduced options. Vicious beasts or misunderstood souls? Make what you will of the message. I have no complaints about it, but the delivery system doesn’t represent a total triumph. Although How to Train Your Dragon has been made in 3-D, the movie’s points tend to come across in a flat, cartoonish fashion that shortchanges the depth and mystery that marks the best animated films. What’s left? A diverting bit of action-oriented 3-D, but one that isn’t likely to establish itself as a timeless classic. Now, let me mention right off that parents who think it’s important that their kids understand that Vikings were Norse warriors, will have some ‘splainin’ to do. For reasons that never are made clear, the adult Vikings in How to Train Your Dragon speak with Scottish accents. The younger characters - particularly the endearing and oddly named Hiccup - sound like all-American kids recruited by central casting. The movie’s strange stew of accents tells us that directors Chris Sanders and Dean DeBlois (Lilo & Stitch) were less concerned with verisimilitude than with finding ways to pour on the 3-D effects and to captivate younger audiences with a variety of colorfully designed dragons with names that sound as if they might have been lifted from the world of professional wrestling: the Hideous Stickleback and the Terrible Terror, for example. In this corner, "Monstrous Nightmare." The story focuses on Hiccup’s increasingly impressive accomplishments. Hiccup (voice by Jay Baruchel) is a sensitive kid who lacks the typical Viking physique. His father Stoick (Gerard Butler) can’t help but be disappointed that the boy hasn’t made the transition from wimp to warrior. Eventually, young Hiccup works his way into dragon-fighting classes where he’s instructed by the gruff but loveable Gobber (Craig Ferguson). He also meets a girl who’s well on her way to becoming first-rate dragon battler, the spunky Astrid (America Ferrera). The movie’s message begins to emerge when Hiccup wounds and then befriends a Night Fury dragon he beneficently names Toothless. At that point, the movie takes on the aura of a boy-and-his-dog yarn, except the dog is a dragon. 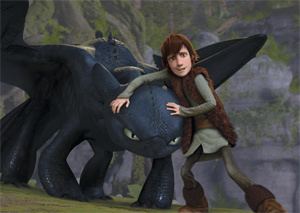 The tension — if you can call it that — develops as Hiccup and Toothless learn to trust each other, a task that requires Hiccup to learn to fly around on Toothless’ back and gives the movie’s animation team a chance to flap its creative wings. Will Hiccup be able to show his fellow Vikings that they needn’t fight? Not without a finale in which a truly dangerous beast must be defeated. No matter how pacific a movie’s goals, achieving them without a tumultuous end-of-picture battle remains a near impossibility. How to Train Your Dragon, adapted from a book by Cressida Cowell, makes Hiccup a little too self-consciously modern, and the movie’s message isn’t subtly enough stated for anyone to miss it. But the 3-D can be fun, particularly, if you’re one of its new fans, and the movie never seems overly impressed with itself. So I’m guessing that kids roughly from seven to 10 will enjoy Dragon’s blend of action and instruction, even if it’s a bit short on wonder and a bit long on noise. Come to think of it, where kids are concerned, I’m not sure that anything can be too long on noise.